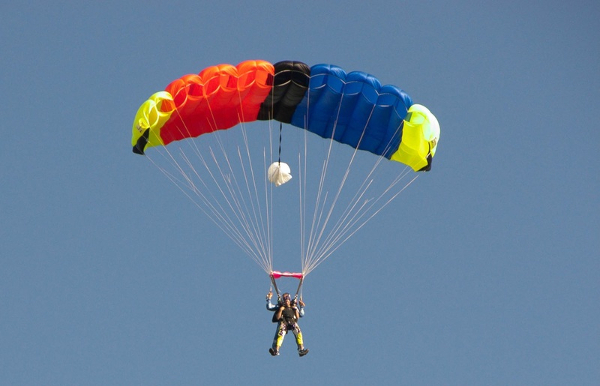 There have been a few recorded cases of people who have survived falling out of planes without parachutes. One case involved a British Airman, Flight Sergeant Nicholas Alkemade, who abandoned his burning plane at 5,500m altitude during the Second World War and miraculously survived the fall with only a sprained leg, landing in soft snow after his descent had been slowed by pine branches. He jumped without his chute because it had been compromised by the fire and he preferred to die by impact than burn to death. If he had been issued with one of my grandfather’s parachutes, the joke would ironically have been lost in the blaze. Many of our students have battled with anxiety and depression. These banes of modern life are not so much rarities these days but are commonly experienced by just about everyone from time-to-time. They are symptoms of our frenetic, inhuman, alienating and unhealthy modern lifestyles. So, we are a society of people who are never depressed although we are all terribly unhappy. We are never anxious and yet we live in paralysing fear. We are all paragons of happiness and yet suicide rates are high. Ridiculous, isn’t it? Let’s stop pretending, shall we? There is a very real problem here that needs solutions. I have lost students to it. Anxiety and depression are not admissions of weakness, they are in fact symptoms of a compromised, modern lifestyle that is not designed to accommodate human life or happiness. As a species, we have not had long enough to adapt to the changing pace of our lives. Almost overnight, we went from hanging around in small family tribes, hunting game and gathering nuts and berries, to commuting for hours every day to sit in artificially lit cubicles pushing buttons in exchange for imaginary, digital wealth that can be taken from us at a moment’s notice that we can in turn exchange for parcels of food wrapped in mysterious transparent membranes. We lost the essential ingredients for true happiness many many years ago in our pursuit for personal comfort, ease and safety. Don’t misunderstand me here. I am a realist. I’m not advocating a return to pre-industrial living because that is impossible. We can’t change our past. But we can apply more careful thought to how we live today and how we are going to live tomorrow. We can become sensitive to our true needs and change our lives to accommodate them. In so doing, we can change our future. I’m no psychologist, but I have learned a thing or two about people over the years. For what it’s worth and in the hopes of helping someone out there before it becomes too late, I have put my thoughts into a 3-step plan. There is no value in belittling the emotions that we feel. If you analyse the feelings or thoughts that lead you to anxiety and depression, you will find that they most likely have very legitimate sources. There are many things about our lives that are simply scary or depressing and no amount of rationalisation can make them disappear. One of the most depressing things about life is that we are all going to die and so are the people whom we love. We can’t deny that. We also cannot deny that there are many hazards, risks and dangers that surround us. If you’re feeling free of anxiety today, just read the world news headlines and your anxiety levels will soar. Certainly, the media sensationalise the truth and blow the risks out of all proportion, but one cannot deny that there are indeed dangers out there. The important step that is missing here is to cultivate a balanced perspective. Sure, life can be depressing when you consider that we’re all going to die, but at the same time it can be full of the most precious and poignant experiences. Watching the sun set on a perfect day with family and friends around a barbeque. Is it all worthless because you and your family and friends will ultimately perish? Would it have been better to not have existed at all? Is it all worth it to see your son smiling up at you after you give him his birthday surprise, or to hear your favourite song playing on the radio or to finally master a difficult series of moves in an advanced kata? Knowing that life is full of wonderful things does not offset the fact that we will ultimately perish or that it sometimes feels as though there is no point to our existence. It just helps to keep these feelings in perspective. There are also many dangers out there, but it is important to maintain a rational mind as to the odds of them occurring. It is entirely possible to trip, fall on to a sharp rock, sever a major artery and bleed to death in minutes before help arrives. In fact, I know of someone that sadly passed away in just such a fashion. It’s just that the odds of this occurring to you are pretty small. Remembering this does not make the danger disappear. It’s still there. It just helps to keep it in perspective. The next step is to accept help where it is offered. Many of us are so depressed or anxious that without medicine or therapy or both, we will not be able to dig ourselves out of the hole that we’re in. There is absolutely no shame in accepting help where it is offered. The true shame lies in the culture that tries to convince us all that if we are unable to pull ourselves together on our own, we are less of a human being. This is absolute nonsense. It makes as much sense as trying to convince a fighter pilot that they do not need a parachute because other people were lucky enough to survive jumping out of a plane without one. Determine to make the change and accept help from whatever sources are available to you. As a matter of fact, the decision to accept help is a far ballsier move than pretending that everything is fine when it’s not. It indicates a decision to change the status quo. To flex your muscles and wrestle back control of your life regardless of what it takes to do so. Sometimes we need help when we find ourselves at the edge of the cliff staring into the void, or the void will consume us. The act of turning our backs to the void and walking away makes us stronger, regardless of whether we needed help to do so or not. It doesn’t make the void disappear, it’s just that we have other, more important things to do in this life than staring into it until it eats us. Once you have accepted help from the outside and feel strong and resilient enough, you should start to prioritise positive change. Being pro-active is an important and over-looked antidote to depression and anxiety. If you suffer from depression, there may be things about your life that could be improved to help you to avoid the black hole. Sometimes the small things make all the difference. Like ensuring that your home is always clean and tidy. It’s amazing what a difference this can make to your outlook on life. Perhaps something bigger needs to happen such as changing employment or even changing your vocation. Life’s too short to be stuck in a job that eats your soul. Perhaps you are trapped in relationships that are triggering your depression. Where possible, make some executive decisions and terminate these negative relationships. Friendship or partnership should never come at the cost of your health and well-being. Where this is impossible, lay down ground rules or limit your exposure to these toxic relationships. They say that you can choose your friends, but you can’t choose your family. If family is the problem, we cannot always avoid these relationships, but we can certainly stand up for ourselves and confront the problem head-on by being vocal and insisting on change. It may have zero effect on the perpetrator, but your act in standing up for yourself will have a huge impact on your own happiness. And who knows? One day they may even listen. If you are anxious about something, prepare to meet the threat head-on. For many of our students, the threat that brings them anxiety is the threat of physical attack or abuse. That is why they came to us in the first place. And that is also why so many of them report that after training with us for some time, their anxiety levels start to drop like magic. It’s because they are preparing to meet the threat. It’s because they are doing something about it. Being pro-active. Empowering themselves. Makes sense, doesn’t it? If you experience anxiety around other people or when going out in public spaces, perhaps you too secretly fear that other people are going to hurt you in some way. Whether physically or socially, it doesn’t really matter. The mechanics of preparation remain the same. Physical threat from another person or other people is the foundation of your fear. Whether you think so or not. Ultimately, knowing that you can defend yourself physically provides you with a base level of confidence which will eventually grow into social confidence. Self-defence is a very deep subject and ultimately involves elevating the basic physical techniques into the mental and social spheres. It may surprise you to know that blocks, re-directions, strikes, grapples and throws have their counterparts in social and mental interaction. This is a big enough topic to warrant its own article or series of articles. Suffice to say that this is so for now. If you are suffering from anxiety and/or depression. Please get help. See below for some of the helplines and services available to you. And once you are feeling more resilient again, start to make positive change in your life. ​You are worth the effort. Blue Knot Foundation Helpline (formerly ASCA Professional Support Line) provides help, information, support or referral for adult survivors of childhood trauma and abuse, their partners, family and friends, health professionals and anyone in the workplace working with people who have experienced childhood trauma and abuse. Call 1300 657 380, 9am-5pm AEST / 7 days a week. Butterfly Foundation’s National Helpline, ED HOPE, is a free, confidential service that provides information, counselling and treatment referral for people with eating disorders, and body image and related issues. Call 1800 33 4673 8am-9pm AEST / 7 days a week. MensLine Australia is a professional telephone and online support and information service for Australian men. Call 1300 78 99 78, 24 hours / 7 days a week. The MindSpot Clinic is a free telephone and online service for people with stress, worry, anxiety, low mood or depression. They provide online assessment and treatment for anxiety and depression. The MindSpot Clinic does not provide an emergency or instant response service. Call 1800 61 44 34 AEST, 8am-8pm (Mon-Fri), 8am-6pm (Sat). QLife provides nationwide telephone and web-based services to support lesbian, gay, bisexual, transgender and intersex (LGBTI) people of all ages. Call 1800 184 527, 3pm-12am (midnight) AEST / 7 days a week. PANDA (Perinatal Anxiety & Depression Australia) provides a national telephone information, counselling and referral service staffed by trained volunteers, professional counsellors and supervising staff. Many helpline counsellors have had their own experience of perinatal depression or anxiety. Call 1300 726 306, 9am-7:30pm AEST (Mon-Fri). SANE Australia provides support, training and education enabling those with a mental illness to lead a better life. Call 1800 18 7263, 9am-5pm AEST (Mon-Fri). Suicide Call Back Service provides 24/7 support if you or someone you know is feeling suicidal. Call 1300 659 467. Veterans and Veterans Families Counselling Service (VVCS) provides 24/7 free and confidential, nationwide counselling and support for war and service-related mental health conditions, such as post-traumatic stress disorder (PTSD), anxiety, depression, sleep disturbance and anger. Call 1800 011 046.